Fidelity Investments recently sent its clients a “Fidelity Viewpoint” entitled “Five Ways To Protect Your Retirement Income. Recommendation number 4 recommends that you “Position Investments For Growth” and presents four different asset allocation strategies which are to be selected according to your risk tolerance, overall financial situation, and investment time horizon. The most aggressive portfolio has 85% allocated to equity. Not bad. However, a 100% stock allocation is even better as will be shown below. Here is the chart that Fidelity uses to show portfolio returns as a function of asset allocation. Using the values provided by Fidelity, the following table shows the values of five different asset allocations. The period under consideration will be the 30 year period starting in 1985 and ending on Jan 1, 2015. The fifth column shows the results of a 100% allocation to a fund that exactly matches the performance of the S&P 500. Data for the 30 year S&P results can be found HERE. The above table shows the values of a portfolio that starts at $1 million and grows to different sizes over 30 years as a function of the asset allocation. Clearly the 100% Equity portfolio outperforms all the other asset allocations. 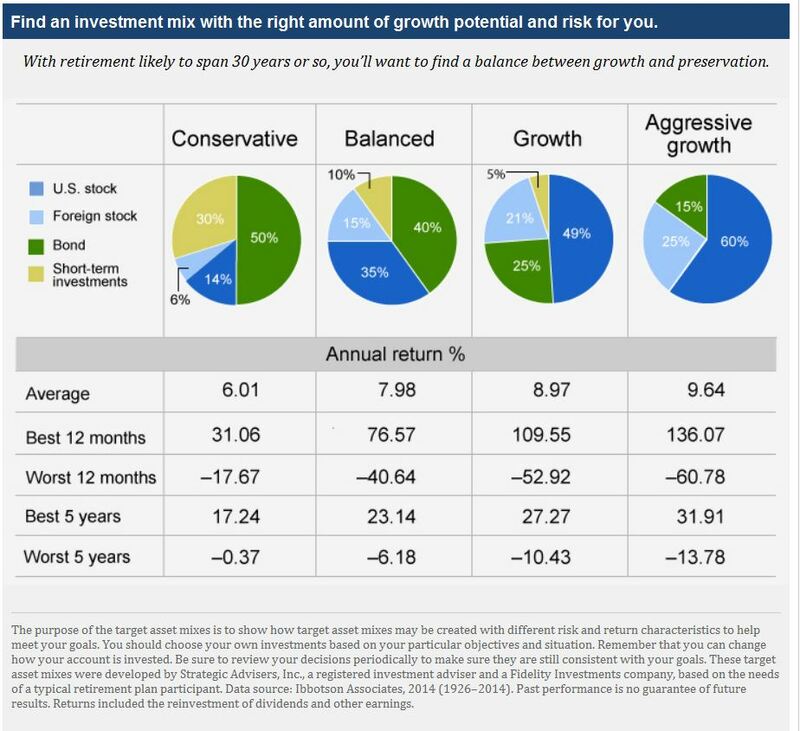 Although retired people are recommended to have a “Conservative” or at best, a “Balanced” portfolio due to the risk of a market downturn, the next table shows that even though the 100% equity allocation loses the largest percent of its value during a 5 yr market downturn, it is still clearly better than any other portfolio in absolute dollars. Because we are dealing with the long run here… 30 years as indicated by this Fidelity page, we can ignore the 12 month variations. The Most Aggressive, 100% S&P portfolio is ALWAYS is worth more than any other portfolio even though it loses a larger percentage of its total value over any 5 year “worst” period. The risk of “running out of money” is greater with the more conservative portfolios because they are not growing as fast – EVEN THOUGH they lose a smaller percentage during downturns. In addition, there is double jeopardy with the conservative portfolios! Not only do you increase the chance of outliving your money with the conservative portfolios, you also risk losing purchasing power due to inflation. There it is. Proof that a 100% allocation to a single equity fund that tracks the S&P500 is better than any other asset allocation even though it is “riskier”.